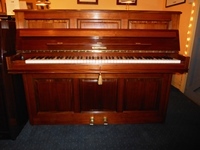 A small upright piano, manufactured in England by Sidney Zender in the mid 1970's in a mahogany case. 7 octave keyboard. 2 pedals (½ blow and sustain). Overstrung with a full iron frame. English underdamper action. Tuned to A=440. Standing at our premises in Dairy Lane, Hambleden. 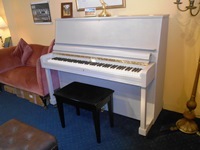 A very good upright piano in an ‘Ash Grey’ chalk paint and waxed finish. An extremely sturdy instrument, manufactured in the Danemann Factory, Northampton Street, London, circa. 1980. 2 previous owners. History available on request. 7 1/4 octave keyboard. 2 pedals (1/2 blow and sustain). Schwander under damper action. Overstrung with a full iron frame. Factory fitted rear toes to ensure stability, and good rubber tyred castors enabling ease of movement and to prevent damage to wooden floors. Fall and lid lock with keys. inclusive of VAT, delivery to ground floor, first tuning and 3 year guarantee. Manufactured circa. 1979 in the factory of W. Hoffman, Langlau, West Germany, an instrument of outstanding quality in a very attractive and unusual satin finished straight grained walnut case with matching inset panels in both top and bottom door. New equivalent price (in standard black case) in excess of £8,800.00. 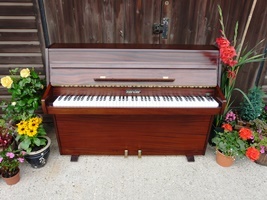 1 previous owner, and now offered reconditioned and in exceptional order. 7 1/4 octave keyboard. 2 pedals (1/2 blow and sustain) and manually operated celeste . Overstrung with a full iron frame and fitted with a Louis Renner of Stuttgart under damper action. Tuned to A=440. Height = 114 cms. Width = 148 cms. Depth = 56 cms. 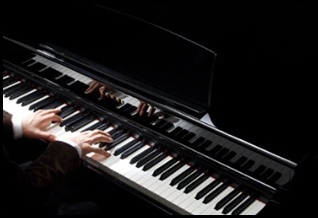 inclusive of VAT, delivery to ground floor, first tuning and 5 year guarantee.